Little Rock, Arkansas may not be the biggest city but its location right in the middle of state makes it the center of everything that happens in the state – including the surprisingly large number of flights every day in and out of Clinton National Airport. The airport is officially named Bill and Hillary Clinton National Airport, formerly known as Little Rock National Airport and Adams Field. “LIT” is centrally located in the state and conveniently located in the city – it’s on the east side of town just a few minutes from downtown. Sandwiched between I-440 and the Arkansas River, it’s easily accessible by all nearby communities including those on the north side of the river such as North Little Rock. As with most busy airports it’s not hard to find hotels near Clinton National Airport. There are numerous places to stay congregated near the airport’s entrance from several large hotel chains, including Holiday Inn, Comfort Inn and Courtyard by Marriott. 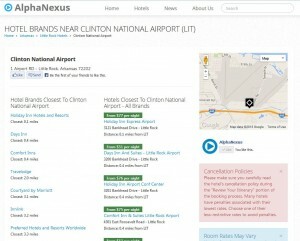 AlphaNexus.com makes it easy to find hotels from your favorite brands near over 150 airports in the United States.